A new way to add value for your key merchant accounts. We have partnered with the leaders in retail cash management solutions to offer a turnkey Remote Cash Capture solution. Re-engage with your customers by taking back the strategic cash relationship from armored carrier services. Streamlined processing, shared workflow and data to enable all participants greater access to information. Control for ANY Size Merchant – Through the use of virtual vaults, you can manage the entire cash relationship for your business customers regardless of geographic location. 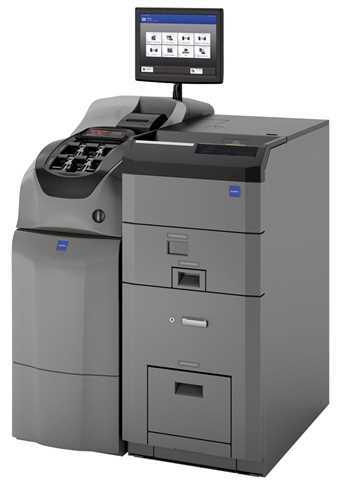 GLORY’s new RBG-300 iCR™ answers retail challenges by providing increased capacity for large deposits and transactions. Designed for back office cash settlement for retailers, till replenishment and easy end of day balancing. It utilizes intelligent bill tracking and internal auditing for optimum security. Contact us to find out how we can provide the right cash management solution for your business.